Caliper has announced that the State Legislative Districts Data Product is now available for the entire USA or for a single U.S. state. Three area databases reflect the latest boundaries for Congressional Districts, State House/Assembly (lower chamber) districts, and State Senate (upper chamber) districts, according to company materials. Microsoft’s flagship mapping product, MapPoint, will be discontinued, along with AutoRoute, Streets & Trips December 31, 2014. Online support will be available for the latter product through July 14, 2015. 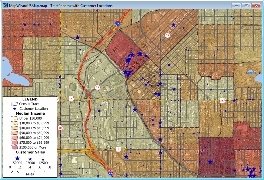 The MapPoint product offered offline routing and basic business analytics. There were problems with its delivery, it appears, as it was on a two-year upgrade cycle rather than the more frequent updates offered by competing software packages. There has not been much press or an official announcement from Microsoft, only mentioned on the official Microsoft landing pages for MapPoint and Streets & Trips (via Neowin). Microsoft has decided to discontinue Microsoft AutoRoute, Microsoft Streets & Trips and Microsoft MapPoint. Maptitude’s Stewart Berry spoke recently with GISCafe Voice regarding their latest Maptitude intelligent geographic information system release. Most organizations are not necessarily geospatially adept, yet they understand the need for some geographic information to either make their businesses run better or to add interactive web mapping to their web sites. In city and county agencies, there is also the need for tools for creating and analyzing redistricting data for districts, and for elections and precincts, there is the necessity to manage the vast amount of data that is collected and aggregated during elections. 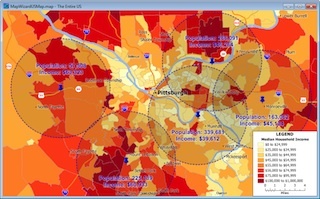 The new version of Maptitude, Maptitude 6.0, is a data visualization and geographic analysis tool that helps organizations understand the impact of geography on their organizations. The newest version includes extensive geographic and demographic data so that you can get started as soon as you open the box. Data are provided in a compact geographic data format that reduces data storage requirements and reduces network traffic. According to Stewart Berry, mapping software product manager, the new version of Maptitude is a “complete refresh” in terms of maps and graphics, routing, database and performance.